Document relational network has been effective in retrieving and evaluating papers. Despite their effectiveness, relational measures, including co-citation, are far from ideal and need improvements. The assumption underlying the co-citation relation is the content relevance and opinion relatedness of cited and citing papers. This may imply existence of some kind of co-opinionatedness between co-cited papers which may be effective in improving the measure. Therefore, the present study tries to test the existence of this phenomenon and its role in improving information retrieval. To do so, based on CITREC, a medical test collection was developed consisting of 30 queries (seed documents) and 4823 of their co-cited papers. Using NLP techniques, the co-citances of the queries and their co-cited papers were analyzed and their similarities were computed by 4 g similarity measure. Opinion scores were extracted from co-citances using SentiWordnet. Also, nDCG values were calculated and then compared in terms of the citation proximity index (CPI) and co-citedness measures before and after being normalized by the co-opinionatedness measure. The reliability of the test collection was measured by generalizability theory. The findings suggested that a majority of the co-citations exhibited a high level of co-opinionatedness in that they were mostly similar either in their opinion strengths or in their polarities. 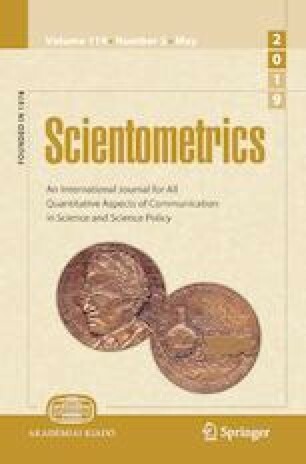 Although anti-polar co-citations were not trivial in their number, a significantly higher number of the co-citations were co-polar, with a majority being positive. The evaluation of the normalization of the CPI and co-citedness by the co-opinionatedness indicated a generally significant improvement in retrieval effectiveness. While anti-polar similarity reduced the effectiveness of the measure, the co-polar similarity proved to be effective in improving the co-citedness. Consequently, the co-opinionatedness can be presented as a new document relation and used as a normalization factor to improve retrieval performance and research evaluation. Esuli, A., & Sebastiani, F. (2007). SentiWordNet: A high-coverage lexical resource for opinion mining. Technical Report ISTI-PP-002/2007, Institute of Information Science and Technologies (ISTI) of the Italian National Research Council (CNR). http://nmis.isti.cnr.it/sebastiani/Publications/2007TR02.pdf.